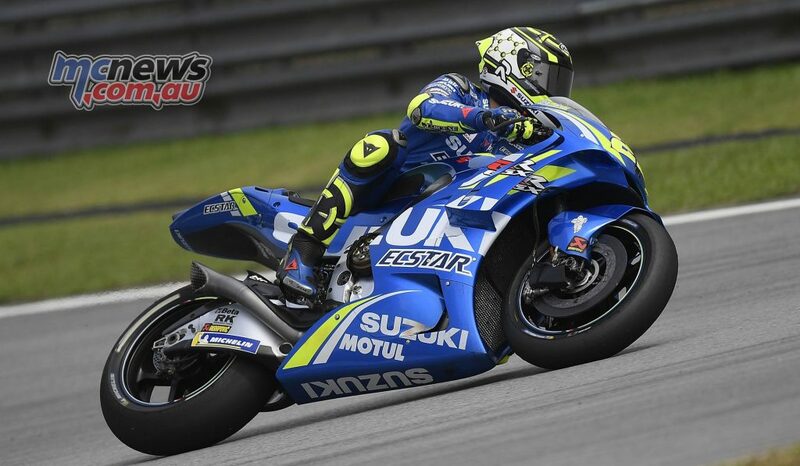 Despite the threat of rain throughout the day, the MotoGP riders were able to get two full dry sessions done and dusted in Malaysia, and it was the Suzuki leading the way as the chequered flag came out at the end of FP2. Rins was the man at the summit thanks to his late FP2 time, with Dovi failing to improve on his FP1 time in the afternoon session – P7 for the Italian in FP2. 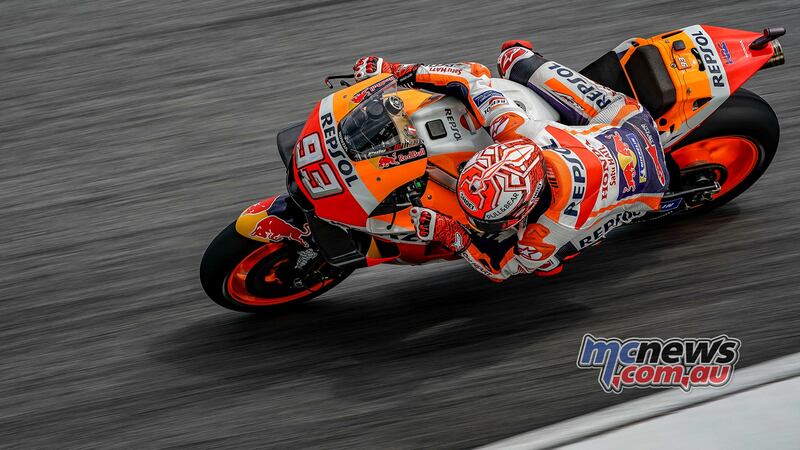 Marquez, meanwhile, finished the second session in P2, but the World Champion had an eventful day. In typical Marquez fashion, the number 93 had to save the front of his RC213V numerous times across the two sessions. There were no such close shaves for fourth place overall and sixth fastest in FP2 Valentino Rossi though, as ‘The Doctor’ had a strong Friday to end the day so close to the top. 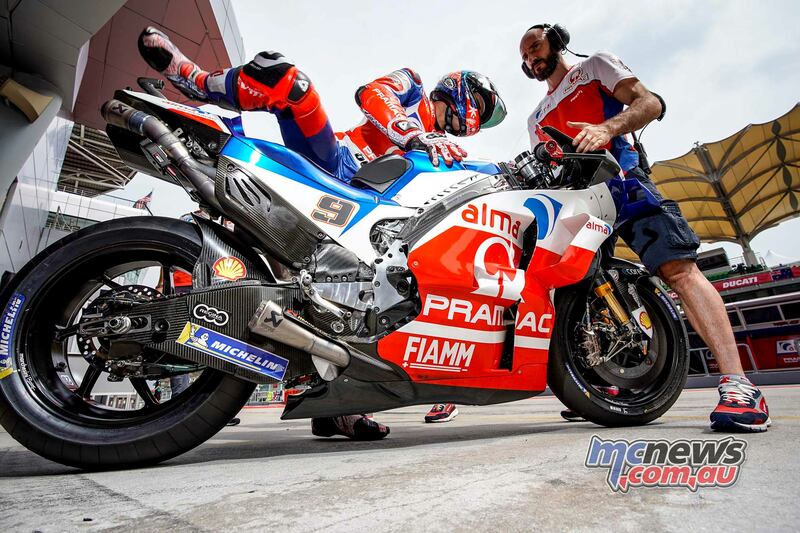 Just behind him and fifth on the combined times was Jack Miller on board his Alma Pramac Racing Ducati, the Australian setting a quickest time of 1:59.771 to end FP2 in P3, and Miller was also the first rider to dip into the 1:59s in FP2. “I had a lot of fun today and I’m satisfied with what we did in both FP1 FP2. I am very confident because we are fast on both race pace and lap time. Tomorrow we will also have to work on the tyres to find out which is the best choice for the race”. 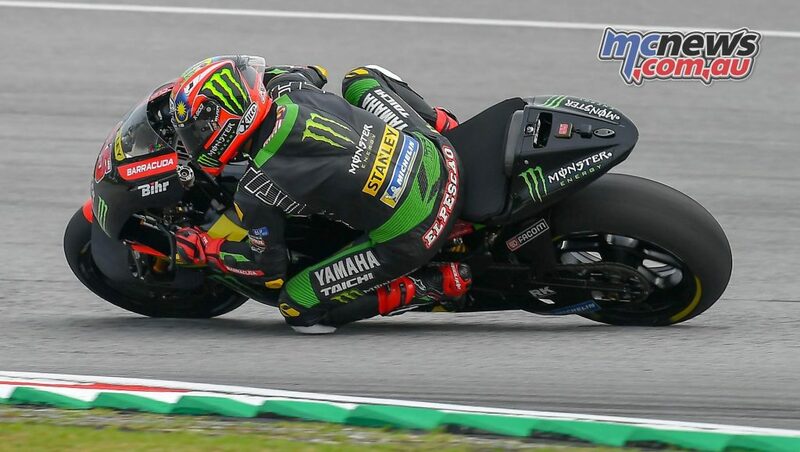 Meanwhile, Australian GP winner Maverick Viñales (Movistar Yamaha MotoGP) completes the day P6 on the overall times, the Spaniard going fourth fastest in FP2 to end the day less than two tenths off P1. Just 0.009 behind him at the end of Friday’s proceedings sits Danilo Petrucci (Alma Pramac Racing), P7 overall for the Italian thanks to his FP2 time, with Johann Zarco (Monster Yamaha Tech 3) improving by over half a second in the second session to end Friday in P8. “We are in good shape in terms of speed but I don’t know if we can be as fast lap by lap on race pace. 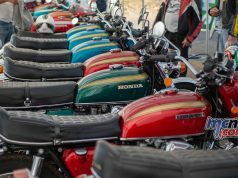 When the tyres start to heat up I feel a vibration that makes me lose grip. I haven’t tried the soft tyre yet and we’ll do it tomorrow. There’s a lot of confidence for qualifying”. 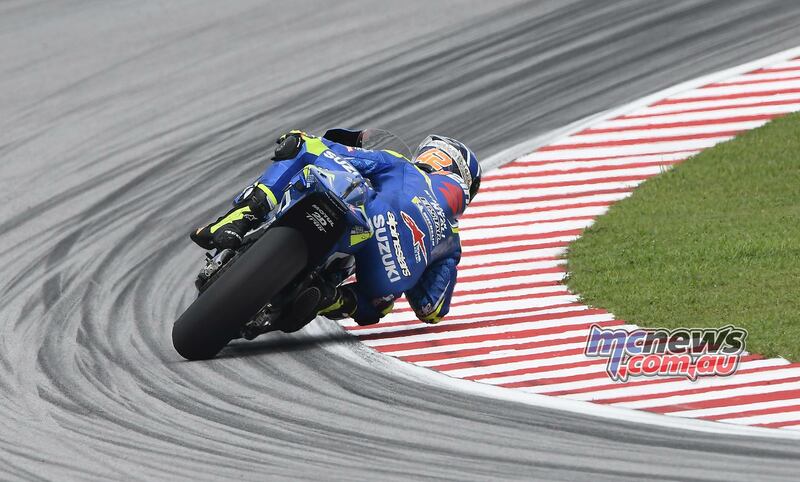 Completing the provisional automatic Q2 places were Andrea Iannone (Team Suzuki Ecstar) in P9 and Aprilia Racing Team Gresini’s Aleix Espargaro in P10 – the latter struggling with grip in the afternoon. 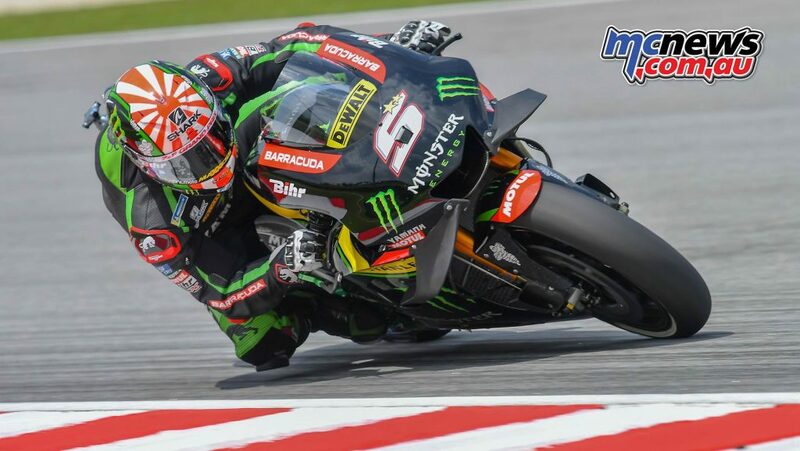 Local favourite Hafizh Syahrin, who is the only rider of the permanent MotoGP field, who had not tested this year before the Grand Prix at the Sepang International Circuit, had the difficult task to make up for this in just two sessions today. Returning from injury, Jorge Lorenzo (Ducati Team) endured a tough opening day. The five-time World Champion finished bottom of the timesheets and over three seconds adrift of the fastest time, and will further assess his fitness on Saturday. The track conditions were tricky for the opening minutes of the second session but with the rain clouds clearing, the Moto2 field were able to get a good dry stint on Friday afternoon. At the end of play, Marquez and Quartararo were the only two riders to venture into the 2:06s, the latter improving from a P13 finish in the morning, but it was Bagnaia who had the advantage in terms of the title fight – with sole rival Miguel Oliveira (Red Bull KTM Ajo) a little further back in eighth. Behind the Portuguese rider, Pons HP40’s Lorenzo Baldassarri completes Friday in P8, with Remy Gardner (Tech 3 Racing) kicking off his weekend with a solid P9 on the combined times – the Australian consolidating a top ten place after ending FP1 in P7. Australian GP winner Brad Binder rounded out the top ten on board his Red Bull KTM Ajo machine, moving up the timesheets after a tougher FP1. Tony Arbolino (Marinelli Snipers Team) ended Day 1 at the Shell Malaysian Motorcycle Grand Prix at the top of the timesheets in the Moto3 class, with the Italian setting a 2:14.227 on a dry Sepang International Circuit before the rain started to fall with just under 20 minutes remaining, curtailing the day’s action. 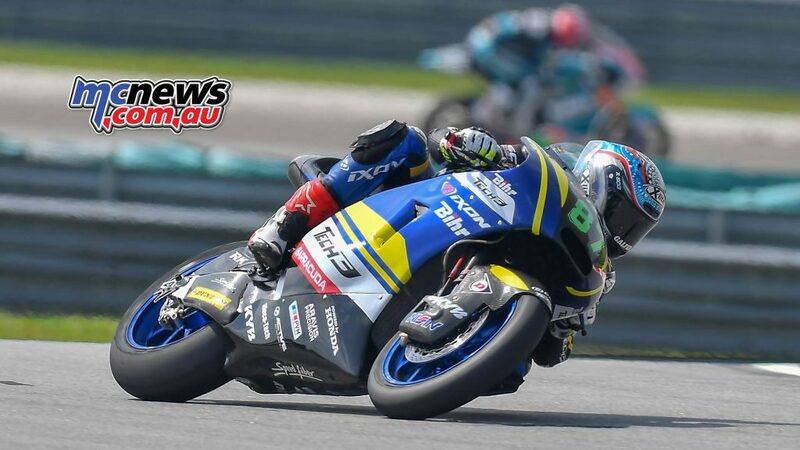 John McPhee (CIP – Green Power) and Aron Canet (Estrella Galicia 0,0) completed the top three, with Championship leader Jorge Martin (Del Conca Gresini Moto3) rounding out a top four covered by a mere 0.024 seconds.